If the federal government tagged millions of iPhone users with GPS tracking devices, the American people—or, at least, Apple devotees—might protest very strongly. But iPhones these days come with GPS installed, and companies make good money furnishing apps that utilize that very feature. On this list: GTX, who offers a pair of $4 GPS apps—GPS Tracking and Tracking—that provide workmanlike solutions for users who want to keep an electronic eye on their loved ones. Superficially, at least, there’s not much difference between these two GTX apps. Both require you to sign up for an account, after which you can start relaying your location to the world. If you want to track the movements of your spouse or look to see if a buddy is nearby for that meeting you planned, though, you’ll have to persuade them to drop $4 on the same app you’re using. (GTX’s apps are available for other smartphone platforms, so it’s not the case that everybody you want to track has to be an iPhone owner.) Privacy is protected here; you can easily block other app users from seeing your location information. 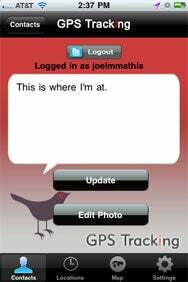 Tweet Your 20: Among the features in GPS Tracking is the ability to post your location to Twitter or Facebook directly from within the app. Tracking isn’t quite as engaged in social media, but it does offer “real time” updates on the location of your contacts. While GPS Tracking requires active participation on the part of a user—you must send your location to contacts or request a location from them—Tracking constantly updates its in-app map with the location of your contacts. (“Real time” can be a bit of a misnomer, however. Users can set the app to update their location at intervals ranging from one minute to one hour.) The good news is that you have to re-start the app every time you re-start your phone, somewhat minimizing the chances you’ll accidentally let your spouse discover you were out playing golf when you promised you’d be at the office. Tracking, in fact, seems better-suited for families who want or need to keep close tabs on the locations of parents, children, spouses, and siblings. For people who want to let friends know where they’re at—and find them, in turn—GPS Tracking is a nice way to do the job without being intrusive. Neither app is flashy, both can put a quick end to accidental games of real-life hide-and-seek.